Last week was Spring Break for my two daughters, so I took some time off from work, blogging, and responsibilities in general. Oh, how nice it was!! We went home to see my parents in Nashville, Arkansas, where I grew up. Gianna, my 8 year old, has the maturity of a 30 year old it sometimes seems. An old soul for sure. She collaborated with my dad to write the account of our escape from Vietnam during the fall of Saigon while I made dinner. Since I just got home from parent teacher conferences with the girls' teachers, I have to say that I am so proud of the education they've received throughout the years at Miss Selma's and now at Baker Elementary. As one mother put it today, if we could stay at Baker all through high school, we certainly would! 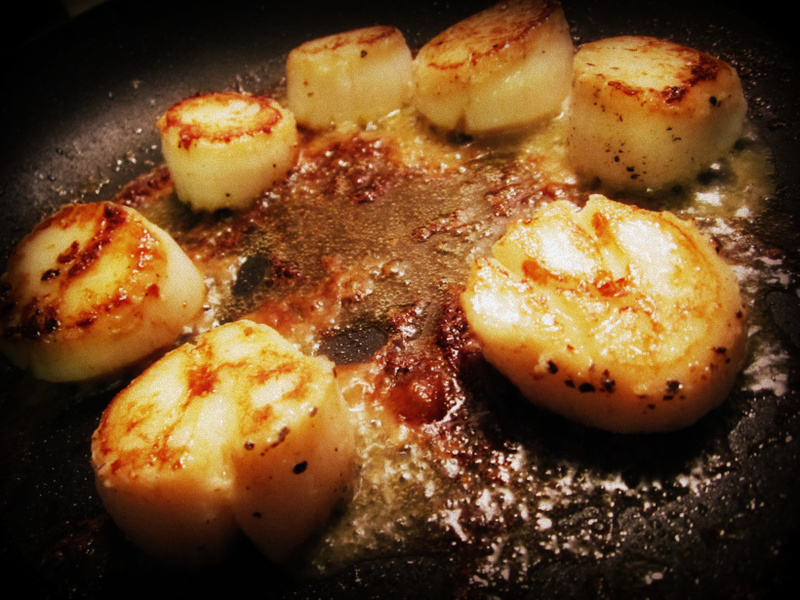 This dish starts with searing the sea scallops over medium high heat on a nonstick pan. My mom has got a really good nonstick Calphalon pan. In another step, dry white wine is added. You can also always add as much butter as you'd like as well! Turn up the heat to cook off the alcohol. Then reduce. I know I said before that I was only cooking with shirataki noodles, but my parents had the old fashioned dry pasta variety. You cook with what you have! Large Sea Scallops, Diver if you can get them. To make the roasted garlic, peel away the outer skin leaving a thin layer. Barely cut off the top of the garlic. Tear off a piece of aluminum foil. Place the garlic heads on top, drizzle with olive oil, and close up the aluminum foil. Cook in a 400 degree oven for 30 minutes. Cook the pasta per package instructions. Drain, then pour into a bowl. Drizzle with a little olive oil and toss to mix. Melt half of the butter in a nonstick pan with a drizzle of olive oil. 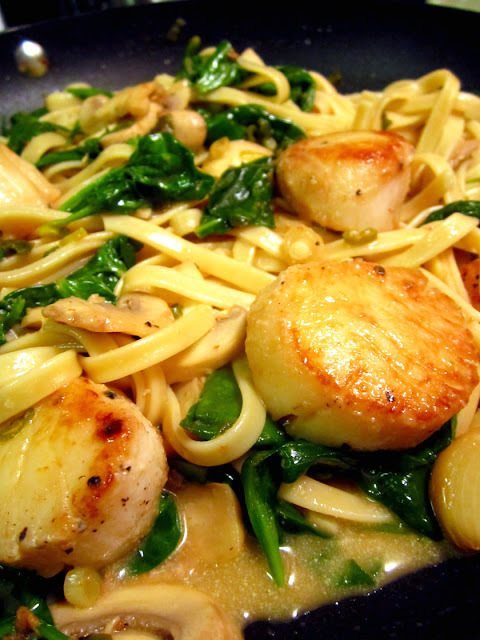 When hot, add the scallops. Cook about 4 minutes per side or until the top and bottom are nicely browned. 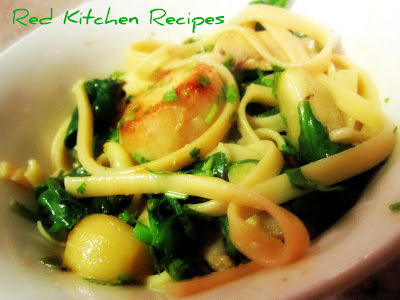 Then remove scallops from the pan and add to the pasta. To the pan, add more butter with the mushrooms and lemon juice. Add the green onions and toss to cook. Add the white wine. Turn up the heat for one minute to let the alcohol cook off. Add more butter if you want more sauce, until it is the consistency that you like. Add the spinach in the end. It doesn't take long to wilt. 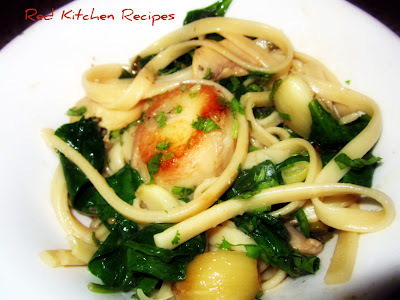 Then add the pasta and scallops back in. The roasted garlic is easy to remove once it's cooled. You can squeeze it out or you can peel away the skin. Add to the pan, and you're done! 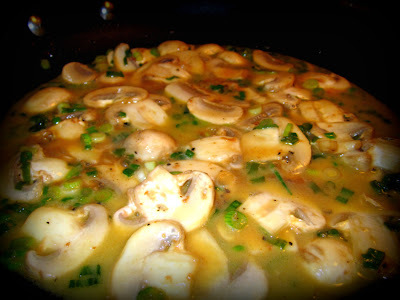 I didn't follow this exactly, I didn't roast the garlic; I minced 2 cloves and cooked it along with the mushrooms and green onions, also used red wine instead (it's all I had) and added some fresh tomatoes. It was delicious. Oh, plenty of white, just not dry!